A small, friendly and quiet lochshore site with 20 pitches - 12 of which have vehicular access. We can allow up to 3 caravans or motorhomes on site at any one time, but caravans must be towed by a four-wheel-drive vehicle and motorhomes are strictly to be under 6 metres in length. We have 4 electric hookups on site. And yes, we are also dog-firendly (we just ask that they are cleaned up after and owners are wary of livestock in the area. Thanks!) All facilities are well-maintained and of high quality using local materials. They are shared with the bothy which can be used as a social/eating area and games room when not booked on a sole use (private hire) basis, allowing a welcome retreat from the sun or rain. Parking is next to your tent pitch which is surrounded by an abundance of wild flowers and wild food plants - both of which we are currently planting more of to encourage interest in wildflowers, foraging and also for the plentiful insect pollinators around the area. Red deer and many magnificent birds of prey often visit close to the site too! Please note although we now have electricity in the buildings and plenty of hot water we have no hard standings or a septic tank emptying point - as we believe this would spoil the atmosphere on the site. Advance booking recommended in July and August. Though rarely a problem here due to coastal breeze please be aware of midges during June through to mid-September. We recommend that you get yourself some repellant - the brand "Smidge" has proven to be the best for most people, but we also recommend trying other brands as a back-up. No matter where you are in Scotland during the summertime, it's always worth being prepared for the midgies! Bookings can be made by email enquiry or by selecting dates from the calendar below. 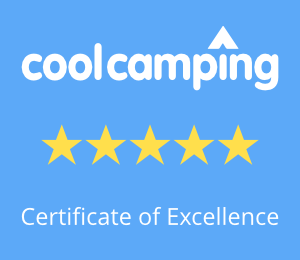 The booking calendar is provided by Cool Camping, where where you can find even more information and reviews of our campsite. We are proud to display the recommendations and the logos of the website providers and marketers we work with below! "We have been camping for 25 years now but we never found such artistic and cosy services as here. We were very glad to find this place"
"Camped in Europe and elsewhere but this beats the best!!!" "Facilities brilliant, best showers in Scotland.Excellent facilities that reflect the generous thoughts of the owners"